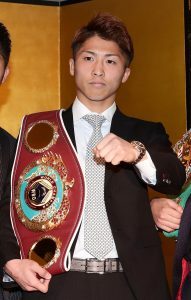 Japan’s Naoya “Monster” Inoue, now 16-0 (14), won the WBA World Bantamweight title on May 25th stopping champion Jamie McDonnell, 29-2-1, of the UK @1:52 of the 1st round at the Ota-City General Gymnasium in Tokyo, Japan. This is the third division title Inoue has won. In Inoue’s next to last fight in December of 2017 Inoue defended his WBO World Super Flyweight title for the seventh time stopping Yoan “Yo Boy” Boyeaux, 41-4, of Beaune, France, at 1:40 of the 3rd round at the Bunka Gym, in Yokohama, Japan. In the sixth fight of Inoue’s career he won the WBC World Light Flyweight title stopping Adrian “Big Bang” Hernandez, 29-3-1, of Toluca, MEX, at 2:54 of the 6th round in April 2014. He made one defense. In December of 2014, Inoue knocked out the former WBO Flyweight champion Omar Andres Narvaez, 43-1-2, of Chubut, Argentina, to win his WBO World Super Flyweight title @3:01 of the 2nd round. Narvaez still holds the all-time record of 27 title defenses. In Inoue’s only bout outside of Japan he fought in the US stopping Antonio Nieves, 17-1-2, in September of 2017 at the Stub-Hub Center, in Carson, CA. Inoue has wins over three current world champions including WBA Super World Bantamweight champion Ryan Burnett, 19-0 (9), of Belfast, No. Ireland, the WBO World Bantamweight champion Zolani “Last Born” Tete, 27-3 (21), of Eastern Cape, So. Africa and IBF World Bantamweight champion Emmanuel “Manny” Rodriguez, 18-0 (12), of Vega Baja, Puerto Rico. All were in the World Boxing Super Series. In Inoue’s only non-stoppage wins in his fourth fight he won the Japanese Light Flyweight title defeating Ryoichi Taguchi, 18-1-1, over 10 rounds. The other decision win was defeating David “Severo” Carmona, 20-2-5, of Mexico City, Mexico, over 12 rounds in a WBO World Super Flyweight defense. The WBC title is vacant. Their No. 1 contender is the WBC Silver champion Nordine Oubaali, 14-0 (11), of France who on June 23rd will meet the No. 2 contender Tassana “Petch Sor Chitpattanna” Sanpattan, 46-0 (31), of Roi-Et, Thailand. The site has not yet been announced. Neither fighter has fought outside his country. From 2010 to 2012 as an amateur Inoue competed in five major tournaments winning but one of them. He was 13-4 losing to Cuban Yosvany Veitia twice, Iran’s Masoud Rigi and Kazakhstan’s Birzahn Zhakipov of which none of these three ever turned professional. Since Inoue has defeated the WBO, IBF and WBA Super World champions in the past they may not be too eager to unify titles fighting him. He just turned 25 in April so he is young enough to wait them out or possibly move up the Super Bantamweight division. The four world champions are the IBF’s Ryosuke Iwasa, 25-2 (16), of Chiba, Japan, WBC’s Rey Vargas, 32-0 (22), of Otumba, Mexico, WBA Daniel “Danny the Baby Faced Assassin” Roman, 24-2-1 (9), of L.A., CA, and the newly crowned WBO’s Isaac “Brave-Son” Dogbe, 19-0 (13), of Accra, Ghana. The No. 1 WBA contender is the interim champion Reymart “Assassin” Gabalo, 19-0 (16), of General Santos City, Philippines. So the future is very bright for the 3-Division champion Inoue who joins two other current multi-division champions. The IBF World Super Lightweight champion Mikey Garcia, 38-0 (30), of Moreno Valley, CA, is a 4-division champion who in July defends his title against the IBF World Lightweight champion Robert Easter, Jr. He held the WBO Feather, WBO Super Feather and WBC Lightweight titles. The WBA Super World Lightweight champion is the Ukraine’s Vasyl “Hi-Tech” Lomachenko, 11-1 (9), of Oxnard, CA. He also held the WBO Feather and Super Feather titles. So as you can see there are many opportunities in the future for Japan’s unbeaten newly crowned WBA World Bantamweight champion Naoya “Monster” Inoue! 3 Olympic Boxing Gold Medal Winners in Papp, Stevenson & Savon! Hungarian southpaw Laszlo Papp won Olympic Gold Medals in boxing in 1948, 1952 and 1956. When the Communist country of Hungary finally allowed Papp to turn professional in 1957 he was not permitted to box other than in Europe. Boxing promoter Lou Lucchese informed this writer that when he tried matching middleweight champion Joey Giardello with Papp the FBI showed up on his door step in Leesport, PA, questioning his interest in Papp. The fight was never made. As a professional Papp was 27-0-2 (15), and became the European middleweight champion in 1962 and defended that title six times before being forced into retirement for refusing to coach the Russian boxing team in 1962. He boxed in Germany, Austria, France, Spain and Denmark. He defeated four Americans with the most known being Ralph “Tiger” Jones.Papp passed away in 2003 at the age of 77.His amateur record was 301-12-6 and was inducted into the IBHOF in 2001. In Helsinki, Finland in 1952 he defeated American Spider Webb. In 1956 he defeated future world champion Jose Torres. 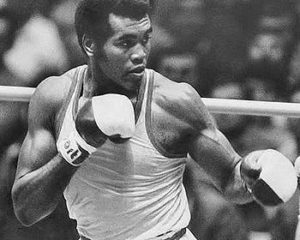 Cuban Teofilo Stevenson was the Olympic Gold Medal winner in 1972, 1976 and 1980. Cuba withdrew from the Olympics in 1984. In 1972 he avenged a loss in the 1971 Pan Am Games to American Duane Bobick defeating him in the Olympics. He was awarded the Val Barker Trophy as the best boxer in the Olympic Games. In 1976 he defeated future world champion John Tate. He won World championships in 1974 defeating American Marvin Stinson and in 1978 defeating future world champion Tony Tubbs. In 1982 he lost to future world champion Francesco Damiani. In the Pan American Games Stevenson in 1975 defeated future world champion Michael Dokes for the title. In 1979 he defeated American Rufus Hadley for the title. In USA-Cuba meetings he defeated Jimmy Clark three times and Tyrell Biggs the 1984 Olympic Gold medalist twice. He defeated American Philipp Brown in 1979. He was 302-22 in the amateurs. He passed away in 2012 at the age of 60. Cuban Felix Savon won Olympic Gold Medals in 1992, 1996 and 2000. 362-21 was his amateur record. In 1992 he defeated American Danell Nicholson and Nigerian David Izon. In 1996 he defeated Luan Krasniqi. In 2000 he defeated American Michael Bennett and future world champion Russia’s Sultan Ibragimov. He defeated David Tua and future world champions Lamont Brewster and Shannon Briggs. Savon is 49 years-old.